← Engine cooling fans-enough time? If you need more reasons to escape from winter’s grasp and head for sunny Florida next February, I’ve got a bunch for you. MACS Worldwide will return to the Caribe Royale in Orlando Feb. 14 through 17, 2018. The event’s theme is ACcess and that’s what the programming is all about: giving you access to the information, training, tools and equipment you will need to make next year the best you’ve ever had in the business. More than 20 technical trainers, specialists and other mobile air conditioning experts are available to you during the MACS Training Event and Trade Show. The program schedule, designed to maximize value for participants, affords the opportunity to select eight training options for a total of 12 hours of focused classroom instruction. Two unique program tracks are offered. One features training for the automotive / light truck arena. A second track caters to those operations dealing with service of HD truck / off-highway vehicles. Since you can’t be in two places at once, but may have interests in both areas, it makes sense to bring a second (and maybe a third) team member along. Beyond the classroom experience, additional learning options abound. A general session on Friday morning adds another two hours to your experience, as presenters focus on this industry’s opportunities and challenges, both current and in the years ahead. A keynote luncheon provides both food and thought, and a second lunch with focused roundtable discussions brings experts together with you and your industry peers for an exchange of ideas in a less formal setting. In your everyday world, most suppliers are represented by voices on the phone, faxes or emails. At the MACS trade show, you have direct, face-to-face contact with the leading manufacturers and suppliers of parts, tools and equipment used in your shop. Suddenly that voice on the phone or other electronic communications has a face and personality, offering a new and better dimension to your interactions. You can also use this time to discover the newest and the best products and services to enhance your operations back home. Last but not least, you know what they say about all work and no play, and the MACS event promises time for some social interaction and fun. It has been my experience that informal discussions and the connections made during the “down time” of these events often provide unexpected epiphanies and sometimes lead to lifelong friendships. 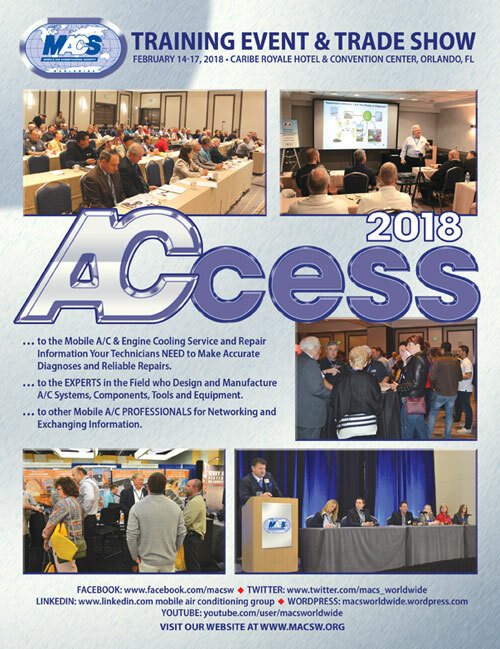 This entry was posted in Automotive, Automotive Aftermarket, MACS Member, Mobile Air Conditioning and tagged #MACSW, mobile A/C training, mobile air conditioning, mobile air conditioning convention, professional service, refrigerant, Section 609 Certification. Bookmark the permalink.